Update: I like Sushine's Creations' tutorial for template piecing even more than the first instructions I posted about below. Ok, the templates and fabric scraps are on their way to Linda in New Jersey. Thank you to everyone who commented or emailed expressing and interest in them, and I'm sorry I can't send a package to each of you. If you want to try the technique yourself you can find instructions here and a very nifty hexagon generator here. 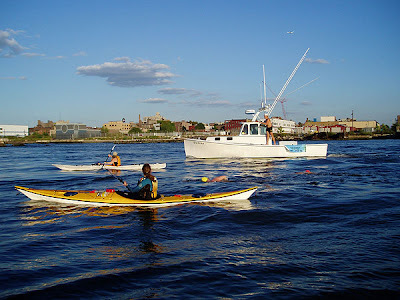 The Manhattan Island Marathon Swim is one of my favorite events in New York. 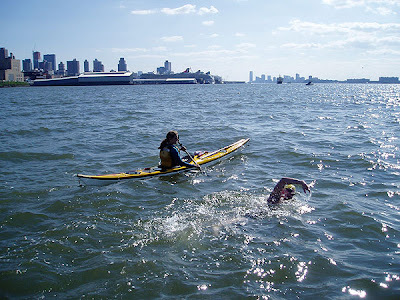 Participants swim all the way around Manhattan (28.5 miles! ), yet the event gets very little press coverage and almost no viewers. I've watched the race and volunteered as a race official, and it's one of those awe-inspiring, chills-down-your-spine events. I admire the athletes as well as the organization itself, which teaches children to swim and helps to call attention to water quality around the island. And now I'm off to run errands. On dry land, thank you very much. That is quite possibly the funniest thing I've read in a while. I love it when programmers have a sense of humor. that is just brilliant! I love the small detailed directions then the whopping three thousand plus mile swim. I have to confess to never having heard of the Manhattan Marathon Swim it sounds an amazing event. i'm not affiliated with stain, i just thought it might be something you'd be interested in attending on a monday night or blogging about. anyway, i just signed up for you RSS feed and i look forward to reading more entries. Hihi. You also get this when you do the route planning from Munich to New York with Google. It also says "Swim across the Atlantic".